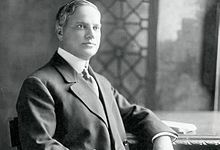 Benjamin Guggenheim was born in Philadelphia, Pennsylvania, US, the fifth of seven sons of the wealthy mining magnate Meyer Guggenheim (1828–1905) and Barbara Myers (1834–1900), both originally from Lengnau, Aargau, Switzerland. He attended the Peirce School of Business (now Peirce College), then one of the most prominent business schools in the country. Guggenheim was Jewish. In 1894, he married Florette Seligman (1870–1937),  daughter of James Seligman, a senior partner in the firm J. & W. Seligman & Co. and Rosa Seligman née Content. Together, they had three daughters: Benita Rosalind Guggenheim (1895–1927), Marguerite "Peggy" Guggenheim (1898–1979) and Barbara Hazel Guggenheim (1903–1995). Meyer Guggenheim was the patriarch of what became known as the Guggenheim family. Lengnau is a municipality in the district of Zurzach in the canton of Aargau in Switzerland. As Aubart and Sägesser reluctantly entered Lifeboat No. 9, Guggenheim spoke to the maid in German, saying, "We will soon see each other again! It's just a repair. Tomorrow the Titanic will go on again." Realizing that the situation was much more serious than he had implied, as well as realizing he was not going to be rescued, he then returned to his cabin with Giglio and the two men changed into evening wear. Titanic survivor Rose Amelie Icard wrote in a letter, "The millionaire Benjamin Guggenheim after having helped the rescue of women and children got dressed, a rose at his buttonhole, to die." The two were seen heading into the Grand Staircase, closing the door behind them. He was heard to remark, "We've dressed up in our best and are prepared to go down like gentlemen." He also gave Etches, who survived the sinking, a message, which Etches wrote down: "If anything should happen to me, tell my wife in New York that I've done my best in doing my duty." Etches reported that "shortly after the last few boats were lowered and I was ordered by the deck officer to man an oar, I waved good-bye to Mr. Guggenheim, and that was the last I saw of him and [Giglio]." Guggenheim and Giglio were last seen seated in deck chairs in the foyer of the Grand Staircase sipping brandy and smoking cigars, ready to accept their fate without fear or hesitation. [ citation needed ] Both men went down with the ship. Their bodies, if recovered, were never identified. Guggenheim's chauffeur, Pernot, was also lost in the disaster. The Unknown Child refers to an initially unidentified body recovered by the Mackay-Bennett after sinking of the RMS Titanic. The grave's headstone read "Erected to the memory of an unknown child whose remains were recovered after the disaster to the Titanic April 15th 1912". Michel Marcel Navratil, Jr. was one of the last survivors of the sinking of Titanic on 15 April 1912. He, along with his brother, Edmond (1910–1953), were known as the "Titanic Orphans", having been the only children rescued without a parent or guardian. He was three years old at the time of the disaster. Eliza Gladys "Millvina" Dean was a British civil servant, cartographer, and the last survivor of the sinking of the RMS Titanic on 15 April 1912. At two months old, she was also the youngest passenger aboard. Eva Miriam Hart MBE was a survivor of the sinking of the RMS Titanic on 15 April 1912. 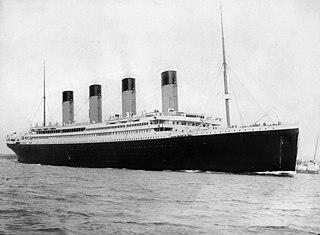 An estimated 2,400 people sailed on the maiden voyage of the RMS Titanic, the second of the White Star Line's Olympic-class ocean liners, from Southampton, England, to New York City. Partway through the voyage, the ship struck an iceberg and sank in the early morning of 15 April 1912, resulting in the deaths of over 1,500 people, including approximately 815 of the passengers. Hudson Joshua Creighton Allison, his wife, Bess Waldo Allison , their daughter, Helen Loraine Allison, and son, Hudson Trevor Allison, were 1st class passengers on board the RMS Titanic, which struck an iceberg and sank on April 15, 1912. Only Trevor survived. Margaret Bechstein Hays was a passenger on the RMS Titanic. She and her dog survived the ship's sinking, escaping on lifeboat no. 7. Following the disaster, she cared for two small children known as the "Titanic Orphans" in her New York City home until their mother claimed them. 1 2 3 4 5 6 7 "Guggenheim, Dying, Sent Wife Message". The New York Times . April 20, 1912. Retrieved April 17, 2012. Efforts to find the body of Benjamin Guggenheim, who was the fifth of the seven Guggenheim brothers, as well as the bodies of other victims, will be made by the six surviving brothers. ↑ "Benjamin Guggenheim". biography.com. Retrieved February 16, 2012. ↑ Poppy Danby (21 March 2014). "Titanic letter reveals new first-hand account of disaster". The Daily Telegraph. Retrieved 24 September 2016. ↑ "Titanic Letters Translated by email Reddit, Reveal Harrowing New Perspective on the Tragedy". The Huffington Post. 21 March 2014. Retrieved 24 September 2016. ↑ md28usmc (21 March 2014). "REQUEST. I own the only set of letters written by Rose Amélie Icard (longest French living Titanic survivor) describing a first hand account of what happened as the Titanic sank. It's written in French and I would love to have it translated so I could have them framed". Reddit. Retrieved 24 September 2016.